IMPORTANT NOTE & PROPERTY DETAILS: Please read the notes below, further down is a write up on the property. 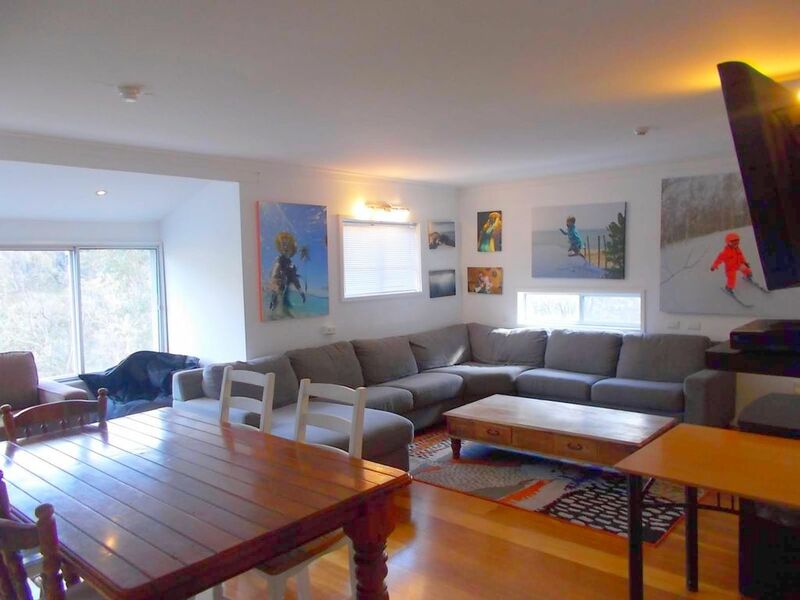 OTHER PROPERTIES: We at Ski Kaos look after many properties in Thredbo and also in Jindabyne. If this property doesn’t suit please contact us and we can email you a full list of choices based off your dates and the number of people you want to accommodate. THIS PROPERTY'S MAP/LOCATION: refuses to show the correct location, its actually located close to the centre of Thredbo only a short walk to the Village Square. PRICES: For most weeks this website only lets us enter valid prices for 2nights arrive Friday or 5nights arrive Sunday. For other stays please use the Contact Owner button and we at Ski Kaos will get back to you with accurate prices. Also note that HomeAway has already added roughly 10% to Ski Kaos' prices (included in the prices you see here). They will also try to remove contact details from any messages we send to each other via this website. They try to stop us communicating efficiently unless you book & pay first. THREDBO DISCOUNTS: We offer discounts on Thredbo lift passes, lift+lessons passes and children's programs. Our prices are better than any discounts on the Thredbo website or by using a myThrebdo card. HIRE DISCOUNTS: We offer discounts on ski/snowboard hire and clothing hire. DESCRIPTION: Huge fully self-contained 3-bedroom chalet. Ideally located in the middle of Thredbo Village. Book the entire house for your group or family. It’s an easy level walk to the ski lifts, bus stop, shops, bars & restaurants. Spacious with TV DVD/CD, stereo, underfloor heating. "FACILITIES: This Chalet also features 2 dining tables & chairs, a huge living room with lounges, gas fireplace, a full laundry (WM CD tub), a drying cupboard, and two balconies with great views of the mountain. The big kitchen features: a large gas stove/oven, dishwasher, microwave, fridge, kettle, toaster, loads of plates, pans, cutlery, cookware. The modern bathroom has a shower, bath & basin. There are 2 separate toilets so the bathroom does not get too busy (no toilet in the bathroom). BEDROOM #2: Queen Bed and a set of Bunks. BEDROOM #3: Double foldout sofa and a set of Bunks. LIVINGROOM: Double fold out sofa. PARKING: When booking this Chalet you get priority to use the parking out front – this can fit one large car or minivan, or 2 small cars. For extra parking, Thredbo’s huge free overnight car parks are only 200metres away. SECURITY BOND: Before check in we require a $500 security bond - this is usually a credit card pre-authorisation (not a charge). Its possible to do this via HomeAway(Stayz) but they will charge your card and then later refund it which is not the right way to do it. ACCOMMODATION DAYS OF THE WEEK: the best value days of the week to make a booking are always for 5-nights arriving on any Sunday. Weekends (Fri+Sat nights) are pricey by comparison. I thought I'd put a review up so people booking the "Pulpo Granny Flat" knew what they were getting. We were a group of 3 males ranging in age from 30's to 50's visiting Thredbo for a mountain biking trip. We just needed somewhere cheap for 3 nights where secure bike storage was possible. The Pulpo Granny Flat was around 1/3rd the price of other apartments in Thredbo and had plenty of room to fit bikes either on the elevated concrete slab or in the main living room. It has a small kitchen where you could cook if needed. It is, in reality, the basement of the upper apartments with besser block walls, a floating floor fitted and a kitchen and bathroom. There is one bedroom with a double bed raised on the concrete foundation of the building and a single bed raised on a wooden frame. A sofa bed in the living area is the other sleeping option (I actually just put the mattress on the floor instead of unfolding and refolding the sofa bed every day). I'm not sure how it is heated and would be interested to see if it stays warm during winter. We were there in summer and temperatures were mild. There is no parking spot with the accommodation so you need to find parking in one of the free carparks and walk. If you're looking for luxury, then look elsewhere. If you're looking for a fairly cheap and perfectly functional place to shower and sleep for a few nights, then the granny flat was great (although one of our group was too tall for the shower and had to duck down to fit). The Pulpo Granny Flat was fine for 3 blokes on a bike trip but I probably wouldn't take my family there as it is a bit too "rustic". Booking was messed up ordered linen did not get it. Thanks for the stars ratings. Note that I have searched our bookings database thoroughly but we have not had any booking in any property this year under booked by anyone named Kathy. I certainly am not aware of any booking where linen was promised and not provided. I wish i knew who you were so i could look into this. Enjoyable stay in central Thredbo. Comfy beds and fully equipped. Apartment is dated and could do with a paint throughout and new carpet and loungesuite. A rennovation would bring it up market as the location is great. Bathroom needs a refurb to modernise. Anyone reading the above review should note that Lisa stayed in Tombarra 6B apartment (not Pulpo or any other specific Tombarra Apartment). Pulpo itself has new carpet, new bathroom and is renovated. Also the new owner of Tombarra 6B is contemplating a renovation. Rates will increase for Tombarra 6B should this be confirmed. Current prices do reflect the quality of the property. I had a group of 12, we all loved the heated floors which kept us warm at night. We all loved how spread out it was and everything was accessible! I loved the idea of having two floors! One for all the bedrooms and the other for the lounge room and kitchen. I throughly enjoyed my stay here and highly recommend the company. Defiantly, planning another trip to the snow next year and I know where to stay! Pulpo is only allowed to sleep 6, but I recall you also booked Tombarra next door and used Pulpo to get together in as its very spacious; hence 12 people in total. Stunning Lodge with amazing views - sitting in the cozy lounge looking at snow capped peaks makes for an excellent experience.The landlord was very friendly and responsive to our needs, thus ensuring our stay was wonderful.Enjoy!